HOUSTON - Two American astronauts took a spacewalk Friday to replace aging batteries on the International Space Station. NASA's Anne McClain and Nick Hague worked in space for several hours to swap out three old nickel-hydrogen batteries with more powerful lithium-ion batteries. The station's robotic arm did much of the heavy work already, but the astronauts still had to lug 300-pound adaptors the size of a large coffee table and reconnect attachments. There are more of the 20-year-old station's original batteries to replace. NASA is about halfway through replacing 48 batteries with ones that are expected to last the remainder of the station's life. As NASA continues to move forward with its plans to expand space exploration and research, two more spacewalks are planned for March 29 and April 8. "What's unique about these operations is that we're not just doing two EVAs, we're also doing about 12 days of highly choreographed dynamic operations in order to set up the EVA so that the crew members are able to complete the operations for us so that we can reactivate some power channels," said Mary Lawrence, Spacewalk Flight director. This week, Lawrence said, they have used robotics to prepare the EVAs for human activity. "Most of this work, we prefer to do as much as robotically as possible and that is both to reduce the risk of sending crew members outside for EVAs. and [it] is also a really good exercise and use of our robotic arm and capabilities we have associated with that," Lawrence said. On Saturday, they kicked off operations on the 4A power channel, discharging and draining the batteries in order to make them safe for removal. On Monday, the team terminated the drain on the batteries and got started on the robotic operations. "Up to this point, we've already removed two of the hydrogen nickel batteries, and we've replaced one of them with a lithium ion battery. We're going to continue to do these robotics for about 48 hours and then we will be complete with that. Then we will stand down while we prepare the crew to go out. They will essentially complete the operation for us, hooking up an adapter plate and some cabling enabling us to complete the circuit," Lawrence said. Each lithium ion battery weighs about 300 pounds on Earth. The crew has prepared by reviewing their mission and processes as well as having their spacesuits fitted to a T. Officials said the astronaut's preparation alone the day of the spacewalk would take 5 hours before they would be ready to go outside. "The robotics sets us up to go out the door with three Lithium Ion batteries installed on the truss. We remove the adapter plate from the exposed palette and take it over to the truss. Once we mate the adapter plate, we connect an umbilical, and that will mate the battery pair so that the battery channel can reactivate," said Jacklyn Kagen, lead spacewalk officer. On Thursday, the Russian Soyuz launched American astronauts Nick Hague and Christina Koch as well as Russian cosmonaut Alexey Ovchinin into the world's only lower earth orbit space lab. "Having the crew back up to six again really puts us in a position to be able to do these EVAs, which quite frankly we've been talking about for the better part of a year," Todd said. EVAs or "extravehicular activities" will take place as spacewalks; each of the teams will be in two and perform upgrades to the ISS. The first two spacewalks will include the replacement of 12 nickel hydrogen batteries. Instead, the teams will install some of six energy-dense lithium ion batteries. "We go through a sunrise and sunset every 90 minutes on Station, so we don't have the benefit of having the sun all the time," Lawrence said. "So these batteries are critical." It is also a big step for women. While Hague and McClain will execute the first spacewalk, McClain and Koch will do the second, which will take place March 29. That pair will be the first all-female duo to perform a spacewalk. 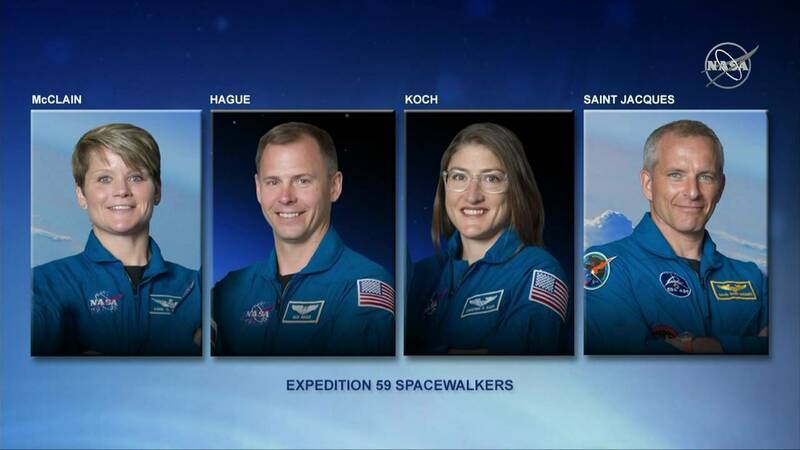 "If they can inspire the next generation of space explorers, they are certainly worthy of that inspiration, and I'm certainly proud to be a part of it," Lawrence said. Lawrence and the Lead Spacewalk Officer, Jacklyn Kagey, are also women who will help lead the mission. While the McClain/Koch pairing was not intentionally made for two women, students participating at Space Center Houston's Girls STEM Academy, could not help but be inspired. "It shows me that women can do whatever they put their minds to," said Taylor Ardowin, 14, who attends seventh-grade at a school in Port Arthur. Ardowin is part of Space Center Houston's five-week academy to encourage female students interested in science, technoligy, engineering and math to learn and cultivate their curiosity. The same day of the NASA news conference, the girls were at Space Center Houston, using drones to simulate a real mission to Mars, focusing on leadership roles and communication. "They are going to perform EVA while on Mars, and they are actually performing a couple missions where they are recovering the opportunity rover that we've recently lost," said James Wigfall, education manager. Meanwhile, at the Johnson Space Center, officials said the female pairing was not intentional. They were selected for their skills and expertise and not necessarily because of their gender. "It's fantastic that it turned out that way, but it starts with basic competence and abilities," Todd said. "These two spacewalkers are just solid." As for the three astronauts? "They're very excited and very well prepared," Lawrence said. NASA officials say they are proud of all of the astronauts doing the spacewalks. The first one will be Friday morning. 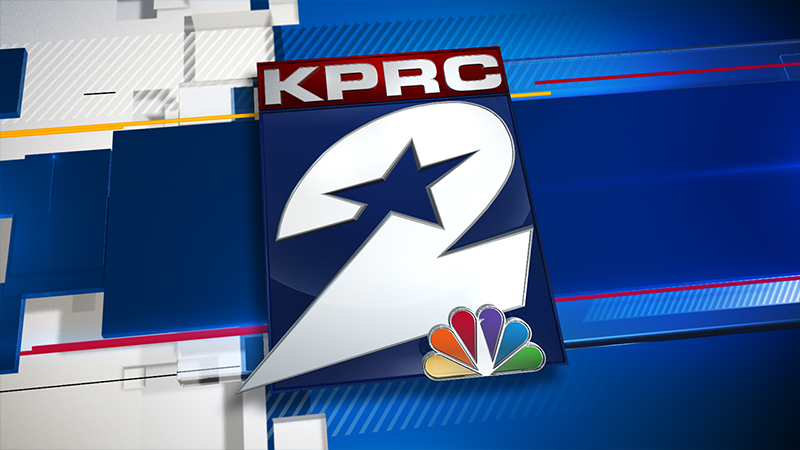 Coverage on NASA TV will begin at 5:30 a.m. The actual walk will take place at 7:05 a.m. Viewers can watch it live at Nasa.gov/Live.